ecoacre | EcoAcre is an ecological living demonstration project featuring a solar powered off grid rammed earth home that shows how green building provide affordable, safe and comfortable alternatives to the unsustainable environnmental and economic methods of construction methods, and energy and water use. EcoAcre is an ecological living demonstration project featuring a solar powered off grid rammed earth home that shows how green building provide affordable, safe and comfortable alternatives to the unsustainable environnmental and economic methods of construction methods, and energy and water use. ECOACRE PROJECT and SOLATERRE HOME. 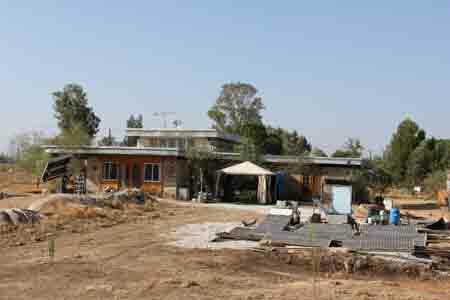 EcoAcre is an ecological living demonstration project featuring a solar powered off-grid rammed earth home that shows how green building provides affordable, safe and comfortable alternatives to unsustainable environmental and economic methods of construction, energy and water use. The concept of EcoAcre is to use as much energy and resources from an acre of desert land to provide for the needs of a family. The residence at EcoAcre is named Solaterre, because it gets its power from the sun and is made from “terre”earth. Solaterre is built with soil from the site with recycled and recyclable building materials are used as much as possible. It has 18 inch thick walls that are extremely strong and keep the home comfortable in extreme desert heat with a SOLAR POWERED COOLER. Solar electric panels provide the energy for the ultra efficient appliances and lighting (windows and skylights provide all the lighting during the day). Solar energy is used for water heating with a backup tank-less water heater that reduces the fuel used for water heating by more than 90%. All the water for the home and irrigation is provided by SOLAR POWERED WATER WELL PUMPS. EcoAcre also features efficient water using devices and drip systems that use a fraction of the water of most homes. The solar water well pumps and the water conserving appliances and irrigation mean WATER INDEPENDENCE. We are currently working on adding a wind turbine to generate additional energy and are planning to install solar thermal collectors and a radiant floor heating system. Follow us on Facebook facebook.com/EcoAcre/. I love your lifestyle. Can a rammed earth home meet building regulations? I live in Las Vegas and in a few months I want to sell my home and build an earth home. Rammed earth really resonates with me.